It was late 1981, when Manuel Göttsching returned home after a lengthy tour with Klaus Schulze. The two pioneers of the Berlin School of electronic music had spent much of 1981 touring their latest albums. Manuel Göttsching’s most recent album was Belle Alliance. This was his fifth solo album, and the fourth to bear the Ashra name. Belle Alliance had been released by Virgin Records in 1980, and was the followup to Correlations, which had been released in 1979. Correlations was another genre classic, and introduced Ashra’s music to a much wider audience. Many newcomers to Ashra’s music began delving deep into Ashra’s impressive and burgeoning back-catalogue. They discovered not just the delights of the previous Ashra albums, but the albums Manuel Göttsching had recorded with Ash Ra Tempel. In total, there were ten albums that bore either the Ashra or Ash Ra Tempel name. This included several genre classics from one of the most innovative and influential German musicians of his generation. The rise and rise of Manuel Göttsching hadn’t happened overnight. It had taken time. Ash Ra Tempel’s early albums didn’t find the wider audience that they so richly deserved. Instead, they won over a small, but discerning group of musical connoisseurs. They were based not just in Germany, but in France and Britain. Soon, Ash Ra Tempel was more popular in Britain and France than in Germany. Gradually, though, Ash Ra’s music began to find a wider audience. This had taken time. Manuel Göttsching had divided much of the last ten years recording and touring. He recorded an album, and then headed out on tour to promote the album. After a while, touring became second nature to Manuel Göttsching. He had grown used to the time he had spent travelling and staying in hotels. It was a means to an end,and meant that night after night, he was able to take to the stage and play live. That was what made everything worthwhile. Especially as the audiences grew and his music began to reach a wider audience. By the time 1981 tour was over, it had been one of the most successful of his career. Buoyed by this success, Manuel Göttsching returned home in late 1981. Despite have spent much of 1981 playing live, he decided to play one more concert. This time, he would play to an audience of one…himself. So Manuel Göttsching made his way to his home studio, Studio Roma. That was where Manuel Göttsching had kept his vast collection of keyboards, rhythm computers, sequencers and synths since 1975. Since then, Manuel Göttsching had put together an impressive array of cutting edge equipment. It was switched on night and day, just in case Manuel Göttsching felt inspired to make music. That was the case on the 12th of December 1981. As Manuel Göttsching entered his home studio, his guitar, keyboards, rhythm computers, sequencers and synths were ready to use. For some time, he had been working on a few themes. They were far from finished though. Maybe he could develop them during his concert for one? After he had finished his preparation, Manuel Göttsching was ready to play. For some reason, he reached over and pressed record. For the next hour, Manuel Göttsching was lost in the music. He played with fluidity, the music flowing through him as he used just two chords. Everything seemed to fall into place. That was the case when Manuel Göttsching switched between instruments. There wasn’t a note out of place. Little did Manuel Göttsching realise that this was a once in a lifetime experience, that most musicians could only dream of. This only became apparent later. After nearly an hour, Manuel Göttsching’s concert was over. Out of curiosity, he rewound the tape and began sat down to listen to his performance. As Manuel Göttsching listened to this hour long piece of music, musical genres melted into one. Elements of ambient, avant-garde, Balearic, Berlin School, electronica, Krautrock and rock shawn through. The music was variously understated and minimalist, sometimes taking on experimental, Eastern and futuristic sounds. Other times, it was elegiac and ethereal, while, the rhythm computer added a mesmeric, hypnotic quality. Later, Manuel Göttsching added glistening crystalline guitar solos. They combined with washes of synths and a myriad of left-field sounds. It was a captivating journey that featured nine separate phases. Each of these phases had one thing in common,..they were flawless. Somehow, Manuel Göttsching had managed to play for an hour without making a mistake. This was a once in a lifetime experience. He had managed to write, record and produce an album in one night. This wasn’t how it was meant to happen. After the release of Belle Alliance, Manuel Göttsching’s thoughts turned to his sixth solo album. He thought it might take a year complete the album. By the time, he pressed play on the 12th of December 1981, Manuel Göttsching had only got as far as few themes that he hoped to expand on. These themes came to fruition that night. This presented a problem though. What should Manuel Göttsching do with the recording? He had two options, add it to his archives or take it to Virgin Records. However, Manuel Göttsching was unsure where he stood with Virgin Records. His four album deal had expired, and he was unsure if they were going to take up the two album option. Things were up in the air. If he was going take the recording to Virgin Records, Manuel Göttsching needed a title for the album. The title he came up with was E2-E4. 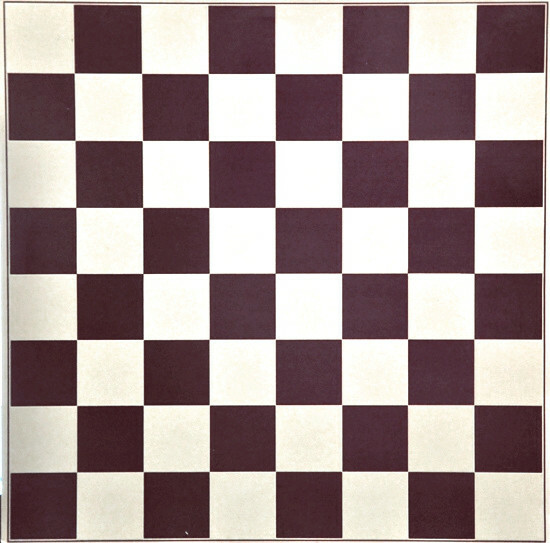 This was the classic opening gambit in a game of chess. E2-E4 was also the title of a computer program that Manuel Göttsching had been using. This he thought would be the perfect title for a piece of electronic music. However, there was a third reason why E2-E4 worked as a title. It was a reference to the guitar tuning Manuel Göttsching used. The lower string was tuned from E2 and the high string from E4. Manuel Göttsching had the title to his sixth album. All he had to do, was convince Virgin Records to release E2-E4. Not long after completing E2-E4, Manuel Göttsching boarded a flight from Berlin to London. His destination was the headquarters of Virgin Records in London. On his arrival, he discovered a very different record company to the one he had signed to in 1977. No longer was Virgin Records releasing the cerebral music it once had. Virgin Records were no longer releasing the same type of music that it once had. Gone was much of the folk and progressive rock that the label released during formative years. A few familiar faces remained, including Gillan, Mike Oldfield and fellow Berlin School pioneers Tangerine Dream and Edgar Froese. However, the musical landscape had been transformed. By 1981, Virgin Records was releasing the remnant of punk, plus post punk, synth pop and the vacuous music of the New Romantics. It was a far cry from Virgin Records’ glory days. Despite this, Manuel Göttsching travelled to meet Virgin Records founder Richard Branson at his houseboat on the Thames. He was no longer played an active role in the day to day running of Virgin Records. Despite this, he wanted to hear E2-E4. The two men listened E2-E4, and the baby Richard Branson was nursing fell asleep. This prompted him to quip: “Manuel you can make a fortune with this music.” However, by the time the meeting was over, Manuel Göttsching had come to a decision. He had decided not to release E2-E4. It wasn’t the time. E2-E4’s time would come. Three years later, and E2-E4’s time had come. The album that Manuel Göttsching had recorded on the 12th December 1981, was ready for release. Not by Richard Branson’s Virgin Records though. They hadn’t picked up the two album option that was included in Manuel Göttsching’s recording contract. This left Manuel Göttsching without a recording contract. Not for long. Soon, he had signed to the German label Inteam GmbH. They were about to release E2-E4. This was the eleventh album of Manuel Göttsching’s career, and his first since Belle Alliance in 1980. Despite being recorded in late 1981, critics hailed E2-E4 as an album that was another innovative and groundbreaking album. It marked another stylistic departure from a true musical chameleon. However, little did anyone realise the influence that E2-E4 would have. By the late eighties, E2-E4 was influencing the nascent techno and house scenes. The first generation of house and techno producers were looking to E2-E4 for inspiration. Some, including Sueño Latino sampled E2-E4 for their 1989 track Sueño Latino. Suddenly, E2-E4 was being hailed as one of the most important and influential electronic albums of the eighties. As the eighties gave way to the nineties, E2-E4 continued to influence and inspire a new generation of producers. Some sampled one of E2-E4 nine phases. However, in 1995, one of the new breed of German production partnerships, Basic Channel remixed E2-E4. It became E2-E4 Basic Reshape as it made its debut on the BCD compilation album. The album that Manuel Göttsching wrote, recorded and produced one night in December 1981 was continuing to influence and inspire a new generation of producers. That’s still the case today. E2-E4 which is a genre classic, continues to influence and inspire yet another generation of producers. They look to Manuel Göttsching’s E2-E4 for inspiration, hoping that they too, will produce a timeless, genre classic. A 35th Anniversary Edition edition of E2-E4 was recently rereleased by MG.ART. It’s a welcome reissue of one of the most important electronic albums of the eighties. E2-E4 played a huge part in the development of house music and techno during the late eighties. Since then, several generations of producers have sought inspiration from E2-E4. Alas, none of these producers have followed in Manuel Göttsching’s footsteps and produced a timeless, genre classic. This was just the latest genre classic Manuel Göttsching had released during the first thirteen years of his career. Nowadays, Manuel Göttsching is regarded as one of the most important German musicians of his generations. He’s a true innovator who influenced and inspired future generations of musicians and producers with a string of critically acclaimed and groundbreaking albums. That was the case throughout his career. Especially during the period between 1971 and 1983. This was one of the most fruitful and productive periods of Manuel Göttsching’s career. From his early days with Ash Ra Tempel, right through to his solo career as Ashra, Manuel Göttsching could do no wrong. Albums like Ash Ra Tempel, Schwingungen, Join Inn, Inventions For Electric Guitar, New Age Of Earth and Correlations feature a true musical pioneer at his creative zenith. So does E2-E4. 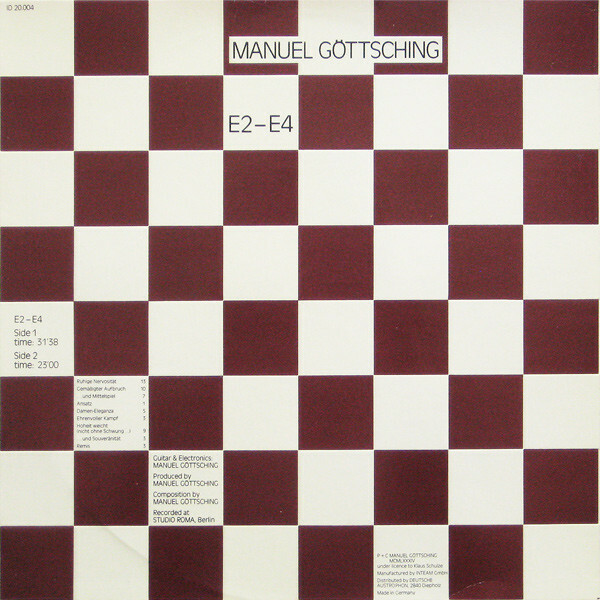 Thirty-five years after Manuel Göttsching recorded E2-E4 at his Studio Roma, on the 12th of December 1981, this timeless genre classic continues to influence and inspire a new generation of musicians and producers. That will be the case for the foreseeable future. ← KATE BUSH-BEFORE THE DAWN.